Detailed review of Clinique Exfoliating Scrub. See how it stacks up against other exfoliators! Clinique Exfoliating Scrub works exceedingly well and is one of our favorite exfoliators. It does a great job at exfoliating the face without causing drying or redness. It’s truly top-of-the-line for those with oily skin or any acne. While we didn’t find a lot of things we don’t like about this product, we wish they didn’t use plastic microbeads and the slight menthol smell could be better. Overall this is a very good exfoliator for one of the better prices we’ve seen among the top products in this category. Clinique Exfoliating Scrub is very thick and almost paste-like. It has really fine, microbeads that are rougher than what we’ve seen in other exfoliators. So it’s really fine but gritty at the same time. We weren’t huge fans of the smell of this one as it has some menthol in it. The good news is the smell isn’t very strong and is barely noticeable. Clinique Exfoliating Scrub is supposed to be used everyday, in the morning. But because this does a really good job at exfoliating, those with sensitive or dry skin might want to space that out a bit. Applying this product is pretty easy. The creamy texture is non-greasy and washes off with no residue. I didn’t experience any redness or drying when using this exfoliator. But since this product is designed for oily skin, those with dry skin may want to use it less often than everyday. We really like the results we saw with Clinique Exfoliating Scrub. After using it, we think it’d be really good for those with acne and/or oily skin. It clears pores which opens the way for other ingredients you might apply afterward (like a mask or treatment). Finally, it leaves the skin feeling very refreshed without any over-drying. This exfoliator has pretty basic ingredients. It has salicylic acid, which is good for acne, so that makes sense. It also has some menthol in it– which doesn’t bother us too much but we’re not fans of the smell. The mechanical exfoliator in this product comes from plastic microbeads, which aren’t great for the environment. There’s been a lot of attention paid to this area recently. Clinique Exfoliating Scrub costs $20.00 for a 3.4 ounce tube. That works out to $5.88 an ounce which is extremely reasonable for this high quality of an exfoliator. 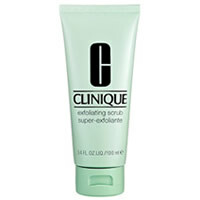 To buy Clinique Exfoliating Scrub, click here.